It may come as a surprise to you, but I'm a big fan of Harry Potter. I know, I know. I never really talk about it. It's not like I named my blog (or cat) after my favorite character or anything. I'll give you a moment to let it all sink in. Moment gone, as is the sarcasm. Has anyone developed a sarcasm font yet? I feel like there is a giant market for that. Anyway. You might also be aware that the holidays are creeping up quite quickly. Here in the U.S., we pretty much get into a holiday fast lane from October-December with Halloween, Thanksgiving and Christmas. One day it's October 1, the next day it's Christmas morning. It is complete insanity. And while I was sitting around, thinking about what gift guide I wanted to do this year for the blog, I decided to make a series. Initially, I wanted to make a geeky gift guide. But no, not this year. This year will be five Sundays of Harry Potter gifts. Is it overkill? Maybe. 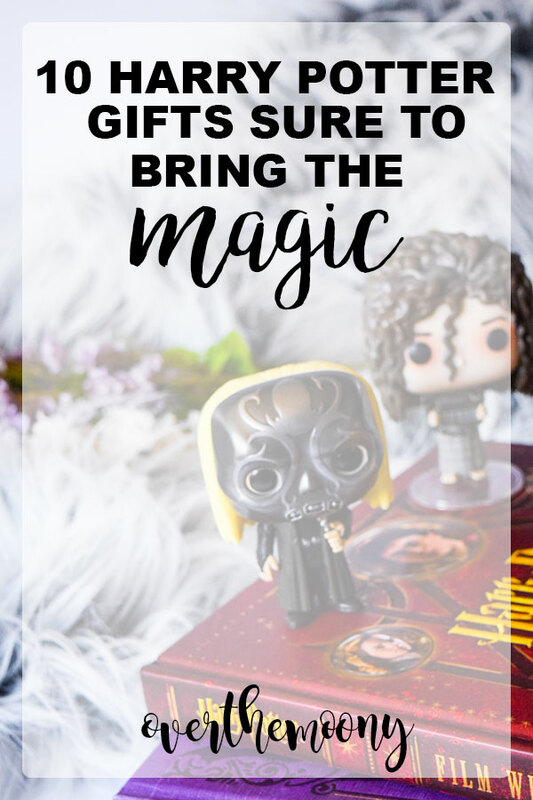 But you may have noticed that Harry Potter is having quite the resurgence thanks to Fantastic Beasts, and if you've walked into a Barnes and Noble lately, there is an entire Harry Potter section of the store FULL of new merchandise and different editions of books. How is one to keep track of it all? How are you, dear reader, supposed to find that perfect Harry Potter gift with all of those options out there!? Take a breath. We'll get through this together. 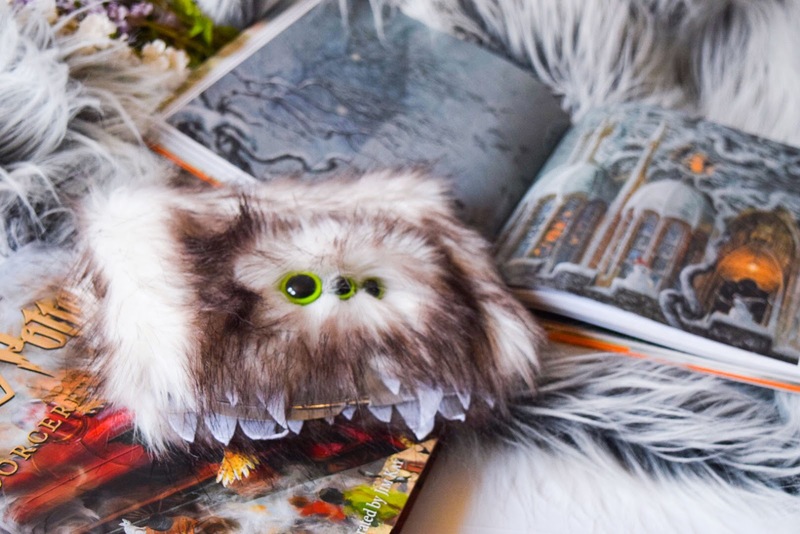 Today, I shall bring to you some of the most general Harry Potter gifts that money can buy. Then, over the next four weeks, we will be narrowing it down to house. Because if you know Harry Potter fans, you know we have lots of pride in our houses, and we all think our house is the best, but of course only one house can be the best and that is the prestigious house of Slytherin. But I digress. SO. If you're ready, I'm ready. Let's check out some super awesome Harry Potter gifts! Did you know that Universal Studios has an online store where you can buy things and have them shipped from the parks? Did you also know that you can buy delicious treats from Honeydukes?! It's a limited selection, but it's the important ones. : Chocolate Frogs and Bertie Bott's Every Flavor Beans. They also have Pumpkin Juice in the adorable packaging from the parks, as well as Sherbet Lemons in a super cute Honeydukes jar and Sugar Quill lollypops. The only downside is that some of the things you have to buy in a pack and can't buy individually so it can get a little pricey, but so can buying this stuff off of Amazon. And I do wish they had a bigger selection, as I would love to have another Chocolate Cauldron. Those things were delicious! When these popped up in Barnes & Noble, I about screamed. They are so cool! 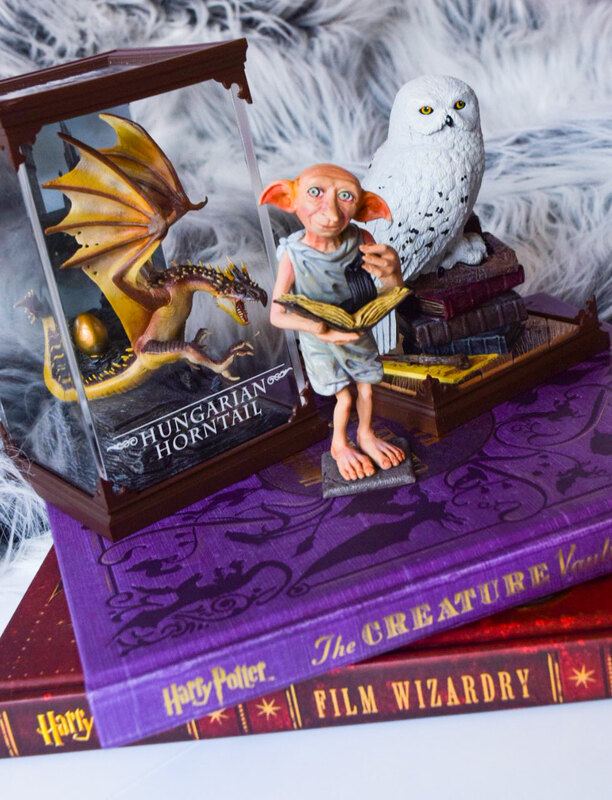 It started with just four: Hedwig, Dobby, The Basilisk, and the Hungarian Horntail from the Triwizard Tournament. Then it branched out to the Ukranian Ironbelly that is guarding the vaults at Gringotts (and is for some reason VERY hard to find), Buckbeak, The Dementor, Fawkes, Nagini, and the Gringotts Goblin. These are made by The Noble Collection, so you know they're going to be good quality! They run for $29.95, so it's going to be a pretty penny to collect them all, but I think they're well worth the money. It's a neat collection to have! One thing I especially like about them is that, while they come in the display cases, they can be taken out and displayed as stand-alone statues. This will definitely be a space-saver as the display cases make these a little more bulky, but the display cases have a scene that the statues are a part of. If you haven't been living under a rock, you know exactly what Pop! Funkos are. If you have been living under a rock, you probably still know what Pop! Funkos are. They are these adorable little statues with giant eyes and heads atop teenie, tiny little bodies and have been a pop culture sensation for years. They cover everything from sports figures to Sesame Street characters to presidential candidates. And, just starting last year, they started to take on Harry Potter. There have been two full waves that have rolled out with the third wave starting to hit stores now, just in time for the holidays! The fun part (or vexing part, depending on your stance) is that there are variants at different stores. For the Harry Potter series, it seems to be that only Barnes & Noble, Hot Topic and Target have been able to get in on that. For the third series, Hot Topic is home to a ton of variant figures, including my two favorites in Death Eater Lucius Malfoy and Azkaban Prisoner Bellatrix LeStrange. These are of course on top of the regular versions of both characters in the third wave. And if Harry Potter himself happens to be your favorite character, you are in luck, my friend! 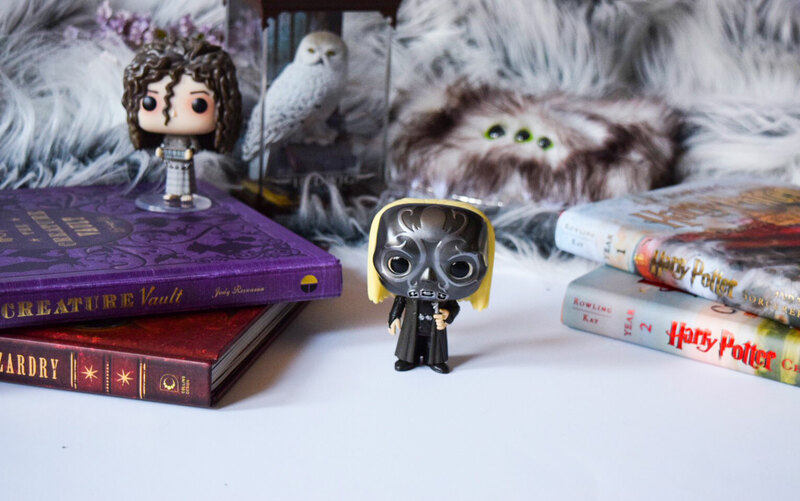 There are a slew of Harry Potter Funkos out there. My favorite? Probably the Sorting Hat version. He is just too cute! And if you're into the torture of the blind box treatment? Don't worry, Funko's got you covered. Because J.K. Rowling just needs to have literally every penny I ever earn that doesn't go toward my basic living expenses, she has these gorgeous special edition books created. If you haven't taken a look at these books, take a look next time you're at a book store. They are gorgeous. 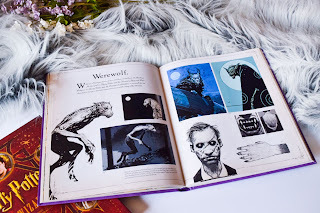 These illustrated editions just started coming out last year and it seems that they will continue to come out yearly until all of them have had the illustrated treatment. So far we have had Sorcerer's Stone and Chamber of Secrets and I can only imagine that they are going to get more gorgeous and have more illustrations as the books continue to get longer. 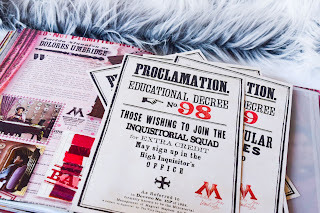 These are an absolute must for any Harry Potter fan, big or small, and I think could be a great way to ease someone on the younger side into starting chapter books. Speaking of J.K. Rowling taking all of my money, let's talk about the gorgeous new designs of the Special Edition Blu-Ray's. The covers on each of these are so visually stunning that it's impossible for me to not want them, which would lead me to believe that that's how most Harry Potter fans are feeling at the moment. They are 2-disc, so you can expect them to be full of special features. I bought myself a UK box set of the movies, and that set had a ton of special features, and I know that the giant box set has a bunch as well, so I'm unsure if the actual content of the Blu-Rays are different than the originals, but regardless, the covers are what matter anyway. Plus, if you buy them from Barnes & Noble, you get two character cards with each Blu-Ray, which means you have to get them all to have the full collection. They really know how to get you! Isn't Etsy just the greatest? You can search for pretty much anything and you'll find it! Such is the case with Harry Potter candles. Want your entire house to smell like Butterbeer? There's a candle for that. How about Christmas at Hogwarts? There's a candle for that. What about The Burrow? You guessed it. There are pages upon pages of all sorts of different candles to make your home smell like a wizarding wonderland. Not down with candles? No worries. Lots of places also offer wax melts, which is one of my absolute favorite things ever invented. This is a much safer alternative if you have nosey pets or grabby kids. Everyone remembers the Monster Book of Monsters from Prisoner of Azkaban. While it had a lot of bite, all you had to do was stroke it's spine and it was a perfect angel, but it was the perfect guardian of all of the knowledge inside! Such is the case with Ellie's amazing Heebie Jeebie Monsters! These little guys are handmade and absolutely adorable. You can get them as a case for pretty much any of your electronic devices, including computers and Nintendo DS. They also are the perfect protector of your money as they can be bought in wallet or purse form! And if you happen to have a Harry Potter fan in your life who also loves Star Wars (which is pretty much everyone, amiright?! ), you can combine their love of both fandoms and get the ever adorable Wookie cover! I have a monster guarding my iPad and he does a bang-up job, and looks insanely adorable while doing it! I do want to stress, however, that these are hand made to order, so if this is something you'd like to get someone and have it by a specific date, please be sure to order well enough in advance! I'm not sure if this is the way all books are, but in this case, it seems like each country and language had a different cover with each more beautiful than the next. 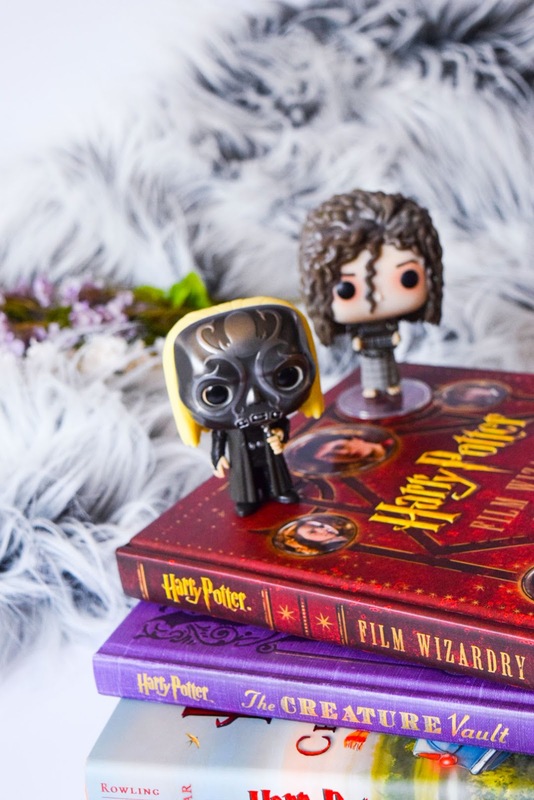 If you're struggling to find a gift for the Harry Potter fan that has everything, see if you can collect some editions of their favorite book from different countries! Thanks to the wonderful thing known as the Internet, it's easier than ever to get your hands on all sorts of stuff from different countries. I know Barnes & Noble sells several different languages, and I'm sure that you can find even more on Amazon. The world of Harry Potter is crazy expansive. 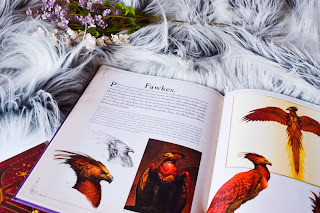 J.K. Rowling can give you the details on literally anything in her wizarding world, and luckily there is a great place to house it all (aside from Pottermore), and that is in these books which I am calling the "vault" books since it sounds good. There are tons of different versions, from the Character Vault to the Creature Vault to the Magical Places. My personal favorite of them all is the Film Wizardry book. 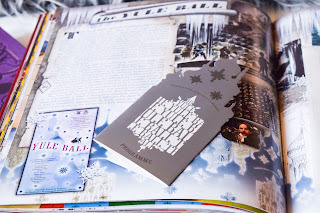 It comes with a ton of extra bits, such as an invitation to the Yule Ball, a Marauder's Map, a small version of Advanced Potion Making, and much more. They all come in little envelopes so you can take them out to look at, but also have a safe place to keep them. Another great one is the Page To Screen book, which obviously outlines how they took the books and made them into a movie. This was the first Harry Potter book I ever looked at when I was up at my Aunt's house for Christmas and was telling her I was thinking about reading the books. It really is quite gorgeous and tells you quite a lot! What's the perfect accessory to all of these books? Bookends, obviously! And luckily there are some pretty cool ones to choose from. Take this Hogwarts Express bookend for example! It looks like it's just tunneling right through your books like it's no big deal. Or you can just skip the train ride all together and just have you books just live at Hogwarts all the time with these super cool Hogwarts Entrance Gate bookends! Us bookish people love to show off our books in the most Instagram-able way possible, and what is better than having either of these beauties in those pictures? And that's all I have for your general Harry Potter gift ideas! Let me know if you have anymore in the comments below. Next week, we will tackle the best house, my house, Slytherin!